An ancient breed of Chinese carp has become one of the world’s most recognizable aquatic species. 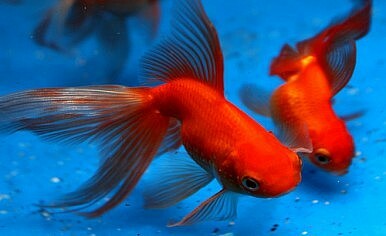 The image of a goldfish swimming in a lowly fish bowl comes to mind for most when it comes to this popular aquatic pet. But this quirky, colorful breed of Asian carp has a more illustrious history than one would suspect. Sometime during the Jin Dynasty (265-420 AD) the ancient Chinese observed that some of the freshwater carp they were breeding as food fish tended to occasionally display mutated colors ranging from red to orange and yellow. A few centuries later, those living during the artistically inclined Tang Dynasty (618-907) began to develop ornamental water gardens which they stocked with a gold variation of the silver Prussian carp, from which goldfish sprang (from the Cyprinidae family of the Cyprinoid order). During social gatherings, some of the finer specimens were temporarily showcased in smaller containers – the world’s first fish tanks – to show off to guests. By the Song Dynasty (960-1279) this practice was commonplace. While this is something casual and easy to pull off in the West today – think of the goldfish in a lowly round bowl – the shimmering creature took on a special symbolic importance in East Asia. In 1162, the then current empress of the Song Dynasty decreed for a special pond to be built and filled with the finest red and gold specimens. It was further declared that those not of royal blood were forbidden from keeping goldfish of the yellow variety, as it was the color of the imperial family. Despite the fact that the yellow strain is easier to breed, to this day the trickier orange line is more prevalent. Goldfish have also come to symbolize surplus and wealth in Chinese culture. The reason for this association stems from the fact that the Chinese word for fish (yú) is pronounced very similarly (but in a different tone) to the word for wealth. According to the principles of feng shui, even a painting of goldfish is said to bring good fortune to its owner, just like a tank teeming with the real thing. Operating within imperial limits and inspired by the positive association surrounding the fish, Ming Dynasty (1368-1644) breeders began to experiment with raising the fish in tanks indoors. This led to further mutations that left some breeds ill adapted to the rigors of pond life. And so began the practice of keeping pet fish. During this period, goldfish began exhibiting new features and were also exported abroad where further genetic tweaking took place. White, black, brown and even black specimens with varied tail shapes began to swim in fish tanks from Europe to Japan. Distinguished examples include the ryukin and tosakin developed by goldfish maestros from Japan, where the fish have taken on a life of their own. By the 1620s even southern Europeans had become admirers of the exotic import from East Asia, which also became associated with good luck in the West. By the mid-19th century, goldfish also gained popularity in North America where they are one of the most common pets today. At present, more than 120 varieties of goldfish exist, categorized by the types of scales, fins, eye structures and colors they exhibit, from the Black Moor and the Bubble-eye to the fancy-tailed Comet, Fantail and Veil Tail. Other peculiar strains resemble animals, such as the Lionhead and Panda Moor. Most varieties of goldfish live well into their teens, and some prove remarkably resilient, living up to 45 years. In a testament to the adaptability and resilience of this ancient breed of domesticated Chinese carp, it was reported earlier this year that “giant goldfish” were found swimming in the waters of Lake Tahoe in California. This new North American strain, which was likely put in the lake by aquarium owners, reportedly grew up to 1.5 feet.